The euro regained some of yesterday’s losses today after falling for three of the last four days. 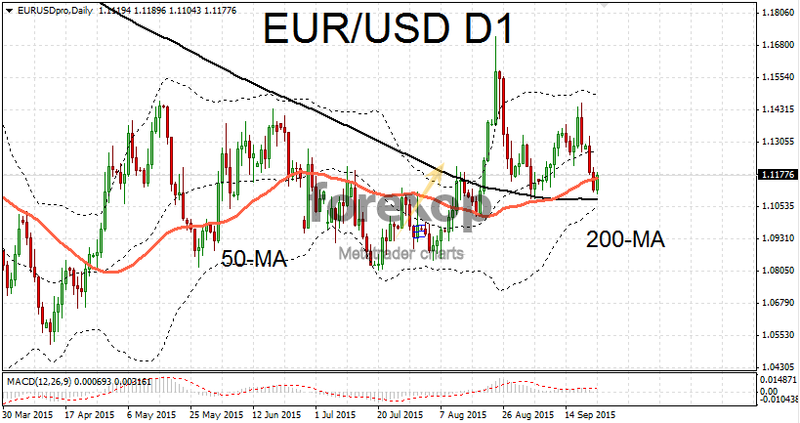 EUR/USD bounced upwards to 1.1177 retracing up from the 200-day moving average. Weak support was established at this level and this was enough to generate ample buying interest. This trend was strengthened after some disappointing factory data from the US. However a slew of poor economic from Germany also gave a mixed picture on the Eurozone’s economic wellbeing. Activity across major sectors including manufacturing and services experienced a marked fall this month according to surveyor Markit. Most prominently Germany’s preliminary purchasing mangers’ index fell to 52.5. The reading was a fall from August in which activity in the sector stood at 53.3. PMI surveys are closely watched because they offer a forward assessment on the health of each given sector. The data also underlines the fact that the Eurozone is not immune to a sustained slowdown in emerging markets. Germany’s export sector is seen as vulnerable on this front. Germany’s services PMI also edged down to 54.3 providing evidence that businesses are less optimistic about the economic future. The euro made stronger gains versus the UK pound. EUR/GBP had its strongest rally in two weeks today with an upwards move of more than one percent. 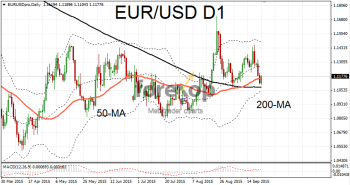 EUR/GBP is now trading firmly within the 0.73 area and has been bullishly testing the range above the 200-day moving average (a critical support/resistance) for the past two weeks. Against the US dollar sterling extended yesterday’s losses as traders revise interest rate schedules. Risk continues to dominate and is working against the British pound as funds move towards yen and US dollars. Commodities had another turbulent ride today after disappointing Chinese factory data came in overnight. GBP/USD slipped back into the 1.52 range for the first time in ten days. Today saw a strong run to the downside with few upward breaks even on the shorter duration. Much of the recent rally has now reversed and cable is at risk of resuming the long term downwards trend. The movements on GBP/JPY were even more exaggerated as the Japanese yen benefits from safe haven flows amid the current market turbulence. GBP/JPY found temporary support at 183.24. If markets continue in risk-averse mode we could see the bearish run moving all the way to the 180 line.